Tag line: "The greatest adventure a man ever lived...with a woman!" 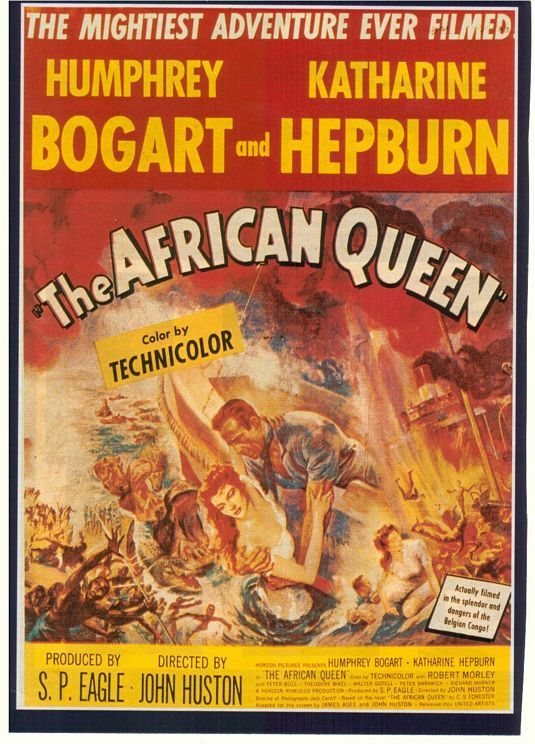 One of the greatest adventure movies of all time, The African Queen also features a romantic pairing that’s among the most unusual ever committed to film. The fact that its managed to become a classic is a credit to its two legendary stars. The year is 1914, the setting: Africa. Even though war has broken out in Europe, a pair of British missionaries, Samuel Sayer (Robert Morse) and his sister, Rose (Katherine Hepburn), have decided to continue their work in German-controlled East Africa. But when the German Army marches in and destroys their mission, critically wounding Samuel in the process, Rose turns to hard-drinking riverboat captain Charlie Allnut (Humphrey Bogart) for help. When Samuel dies, Rose climbs aboard Capt. Allnut’s ship, The African Queen, and the two set sail, hoping to avoid the many patrol boats roaming the river. But when Rose suggests they take the initiative and attack Germany’s most prized gunship, the Queen Louisa, Capt. Allnut is more than a little reluctant to follow her advice. He eventually changes his mind, however, when he and Rose strike up a romantic relationship, which is tested time and again by the treacherous African river. Off-screen, Humphrey Bogart and Katherine Hepburn were as different as Charlie Allnut and Rose Sayer (rumor has it Hepburn even chastised both Bogart and the movie’s director, John Huston, for their continuous drinking). Still, the duo developed a mutual respect for each other, which carried over into the film. And it’s a good thing it did, too, because for much of its running time, The African Queen is a two-character picture, focusing on the pair’s adventures (including an exciting scene where their boat floats helplessly down some violent rapids) as well as their ever-blossoming love affair. Both stars turn in excellent performances (for her turn as the puritanical Rose, Hepburn received her 5th Academy Award nomination, though it was Bogart who walked away with the Oscar, marking the only time in his career he’d ever win the coveted award), and it was their work together that made this unlikely adventure/romance spring so convincingly to life. The African Queen is one of the greatest movies ever made :) I've loved it every since I was a little kid. Bogart and Hepburn have such a magnificent chemistry together!